I have just planted my carrot seeds for the southern summer. I wonder what proportion of early teen children in the overdeveloped world know where carrots come from? I wonder what proportion is "appropriate" or "acceptable?" I wonder whether 100% is the only acceptable number - almost as a "right of the child" to be able to picture where their food comes from and how they are connected to food? 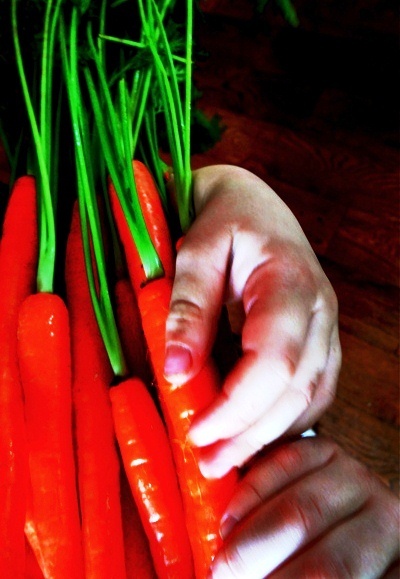 I wonder - in the tradition of positive deviance - how so many children do come to know about the origin of their carrots, and how that knowledge can assist those who don't? Why this whimsical but wonder-ful questioning? I was looking at this wonderful site (related to one of the burgeoning number of projects that set out to financially encourage creative problem solving) and found this project. It's so fricking simple it's brilliant. The need was so clear. Cooking for a private household in a wealthy neighborhood in Connecticut 8 years ago, I brought home carrots with green tops and the kids had no idea what they were. What? You mean carrots aren't those one inch things that come in plastic baggies? At first I thought, "Come on, these kids are fooling me." But nope, since then I've been on a crusade to get kids reconnected to their carrots. To the source of healthy food - the healthy earth and family farms. And that food pyramid, and all that TALK about healthy food just ain't doing it. The kids have to get their hands and their MOUTHS on this food if we want them to start eating it.